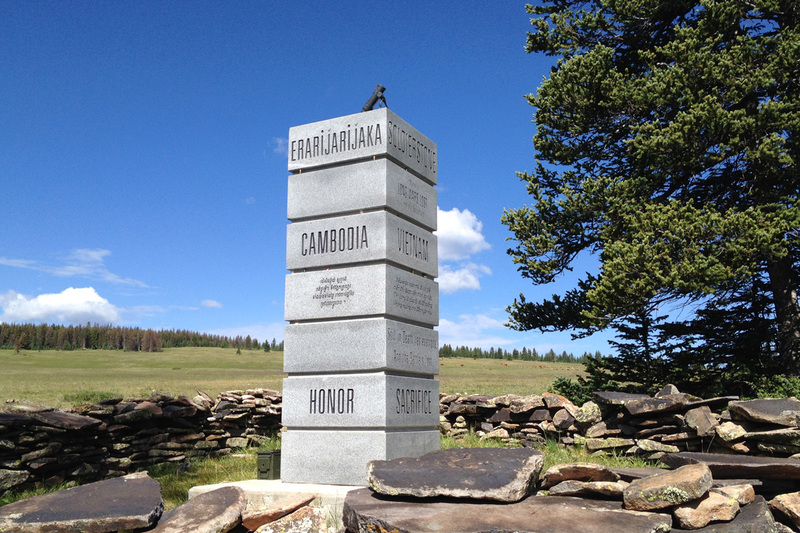 The path to Soldierstone - thousands of pounds of engraved granite hidden in a stand of trees near the Continental Divide - is a straight 100-foot shot from a secluded dirt parking lot. From the nearby Colorado Trail, it's two-fifths of a mile. And yet until 2014, few visitors to the remote part of the Rio Grande National Forest were aware of it. Even now, when many go out of their way to visit the 19-year-old memorial, few know what to make of the towering stone rectangle surrounded by a thigh-high stone parapet. Dispersed about 50 yards from the central marker are 36 300-pound quote stones etched in French, Laotian, Thai, Vietnamese, and Arabic among other languages. 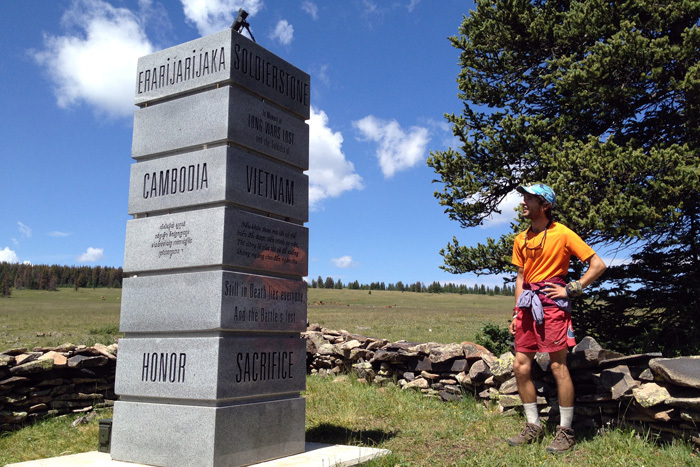 "It does seem pretty remote and almost inaccessible," observed Eben Yonnetti, a Colorado Trail hiker visiting the site. "It does make you wonder about the purpose of such a monument and if it's even meant to be seen. Or if it's just meant to be stumbled across and have people scratch their heads at it." The U.S. Forest Service has posted no online information about the site. There are no interpretive signs. A visit to the nearest ranger station will yield verbal directions on how to get there, plus a paper booklet with bold letters reading "Not intended for display or wide distribution." The lack of an official story surrounding Soldierstone has launched a rumor mill. Some say the marker is illegally on U.S. Forest Service land. Others, curious about how it got built, have concluded that only a helicopter could move such large stones to such remote territory. "Some people say 'Well, it's hidden or it's secret.' Well, that really wasn't the case," said Mike Blakeman, a spokesman for the U.S. Forest Service Office. "We just weren't actively promoting it." 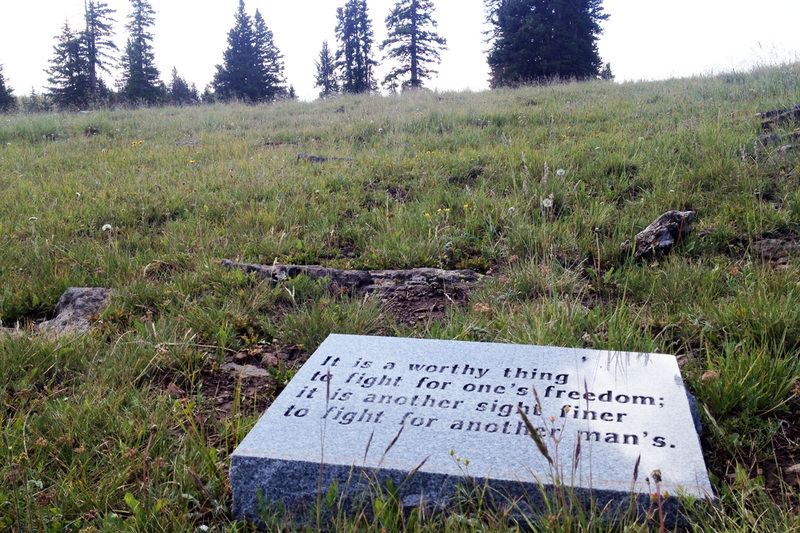 The history of America's war memorials on public lands is one of process and input. There are committees, and sometimes subcommittees reviewing the work of committees. So why exactly was a public memorial built on public land kept private? The answer comes from understanding the veteran who spent years and tens of thousands of his own dollars building Soldierstone: Stuart Allen Beckley. The paths that lead people to Soldierstone vary. 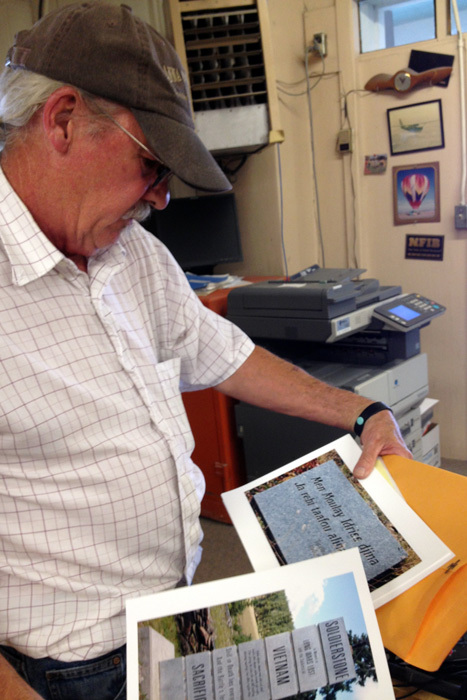 Veterans have shared news of the stone artifact for years through word-of-mouth. For Mike Donelson, owner of Ark Valley Memorial, it began in 1990 when a U.S. Army veteran walked through the front door of his shop in Rocky Ford, Colorado. "He had in mind it was going to be done," said Donelson. "You could tell this wasn't just something he'd just thought about and thought it might be nice to do someday." Retired U.S. Army Lieutenant Colonel Stuart Allen Beckley lived in Texas, but owned property near Westcliffe, Colorado. He made a career in the U.S. Army during the Vietnam War era. According to his family, he did some Special Forces work and trained Thai armed forces in counterinsurgency methods. He also spent time in Laos, eventually retiring in 1972. 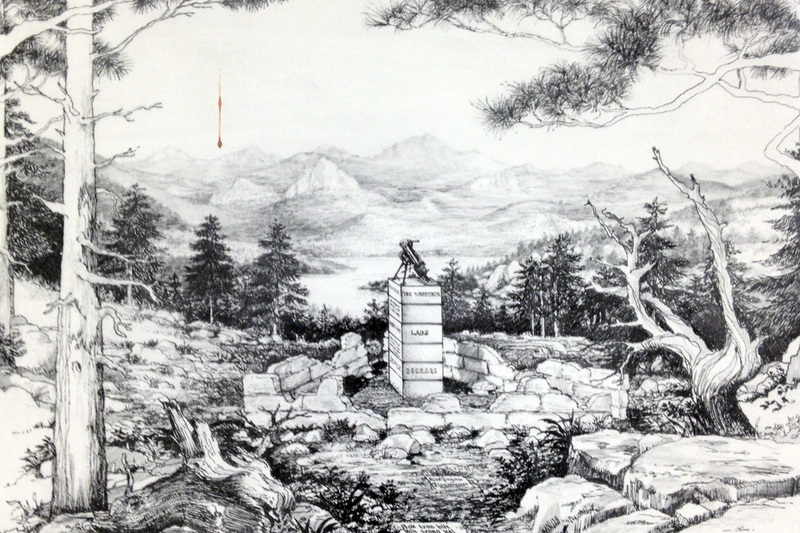 When Beckley first approached Donelson, his plan was to erect "a small memorial project" honoring "unremembered friends from our Indochina experience." His name was to not appear anywhere in association with it. The intent was to offer tribute from American soldiers to forgotten soldiers from "Vietnam, Laos, Cambodia, the Hmong, the Montagnard Tribes of Central Vietnam, the Koreans, Thais, French, Germans, Slavs, North Africans, Black Africans and others of all religions and persuasions who were willingly or unwillingly expended during the long wars lost in hopes, proud and vain, for the people of Indochina, 1945 through 1975." But the exact experiences that drove Beckley to create Soldierstone are still a mystery to Donelson. "I always had the feeling that he had remorse - some things that were eating in his gut that I know had to have happened in Vietnam with his men," said Donelson. "There's a lot of stuff, because he was a [lieutenant] colonel, was revealed on a need-to-know basis." In 1990, Beckley launched a lengthy correspondence that lasted nearly five years until it was built. Beckley was a prolific letter writer and planner who had a clear sense of what he wanted. Donelson was a hard-working stonecutter who saw Beckley's dedication to build it. He asked his customer to pay only for materials, not time and labor. The process started with purchasing 15 300-pound gray stones the size of large tombstones. Before the days of computer generated imaging, quotes were selected, translated into foreign languages and verified by Beckley. Donelson and his assistant sandblasted everything by hand. "Are you charging enough for your work?" 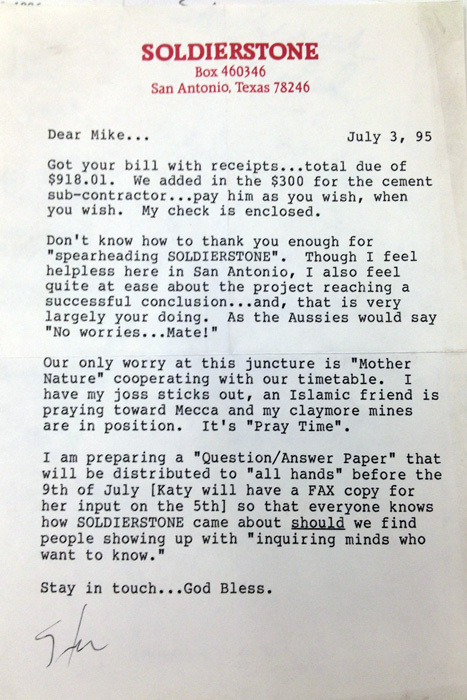 Beckley asked in a letter dated September 1993. "I am sure that some of these stones took considerable more time/effort than you envisioned in your estimate." Donelson brushed off the suggestions of taking more pay. As Donelson inscribed the stones, Beckley took trips to Colorado to scout out the location for Soldierstone. The first spot, private property he owned in Westcliffe, was considered but ultimately dismissed. "I plan to spend a week aggressively scouting the Colorado Trail along the Continental Divide for a National Forest site," Beckley wrote in 1994. "With that found, I will begin the battle for sanction to place the memorial there. My Colorado land is held in reserve should I not gain permission to place it in the high Rockies, or should I die before we get installation approval." By 1995 Beckley had discovered he had cancer and was undergoing chemotherapy treatments. In a letter pleading to U.S. Forest Service officials, he wrote he wanted "no publicity, no open congressional hearing and no media involvement. It is to be American soldiers' anonymous tribute to forgotten soldiers." In 1995, the Forest Service green-lighted the plan, and gave a nod to Beckley's intentions to keep a low profile for the memorial. "The first [concern] was for the potential for lots of publicity which could lead to a second concern which was the impacts of large numbers of people on a somewhat fragile subalpine site," wrote the U.S. Forest Service in 2000 to an inquiring California congressman. "Ultimately these concerns were allayed by Colonel Beckley and the unique project." The one element the U.S. Forest Service didn't factor into its 1995 planning was something that seems obvious now: the information-sharing hub provided by the Internet. The most popular YouTube video about Soldierstone, posted in October 2013, has more than 66,000 views. It features a dirt biker stumbling upon the site. Although the publicity may have been unwelcomed by Beckley, he would have approved of the surprised delight displayed by the videographer as she walks around the discovery. "It's not marked on any maps," is the remark as she walks around the site. Other posted videos are from veterans to other veterans. There's talk of Soldierstone on obscure dirt biking and mountain biking blogs. Rio Grande Ranger District spokesman Mike Blakeman said there has been a significant uptick in traffic. "It appears that social media has caught up with Soldierstone," he said. The U.S. Forest Service is weighing the trade-offs as more people visit. To prevent dirt bikes and ATVs from riding right up to Soldierstone and destroying the surrounding fragile mesa, they constructed a fence. "That has also had the unintended consequences of also then restricting access for individuals with disabilities," Blakeman said. "And so that's a concern of ours because there's a fair number of veterans with disabilities." With no interpretive signs around Soldierstone, and no story on the Internet, the memorial has also taken on a broader meaning for visitors compared to Beckley's original intention. "It's a place for solace, it's a place for people to be able to spend some time at the memorial thinking about some of the lost loved ones - people they were maybe at Vietnam with, or any of the other wars we've been in," said Blakeman. With more traffic comes a question about whether that changes the central meaning of a memorial meant to be infrequently visited. "There's nothing that we can do or should do for that matter as far as slowing that traffic down," Blakeman said. "It's the nature of the times right now. Information flows a lot more easily out there and people have access to it. So Soldierstone has been discovered." Monuments rarely change, but the people and circumstances surrounding them do. Modern historians point to the Vietnam Veterans Memorial Wall in Washington D.C. as a prominent example. Atypical in design, the wall was criticized by some veterans. Today it's largely revered. In the '90s the United States had yet to formally normalize its diplomatic relations with Vietnam. The idea of a memorial honoring foreign soldiers who helped U.S. Forces with the fight was still contentious enough that it gave Beckley one more reason to place it in a remote area. In an unpublished book meant to accompany Soldierstone called Leaves of Stone, Beckley wrote that one purpose is to "serve as a poignant reminder of our battlefield allies. It also asks of America the maturity to honor the defiant stands of soldiers in their seasons of death." Lt. Col Beckley's sister, Phyllis Beckley Roy said he didn't want anti-war protestors to come and tear it down. "When people see it, everyone has said that they've been struck by it," she said. Without a book, website or interpretive sign, Roy has become an unofficial ambassador for Soldierstone, fielding phone calls and emails about its meaning and how it's impacted people. "Most people think that it's to honor Vietnam veterans and it's not," she said. People haven't lost interest though when she explains the intent behind the memorial. Nevertheless, she still worries about vandalism. She doesn't give out the exact location of Soldierstone - and neither will we. After attempting to finish and publish Beckley's manuscript for years, Roy recently handed the task over to another family member to complete. "See that's the problem. Everyone that's going to be involved will be older than dirt," said Roy, who's in her eighties. One of Beckley's right hand men in the Soldierstone project, a veteran named John Callahan, passed away in 2012, taking some of the memorial's stories with him. Our limited time here is always a challenge. 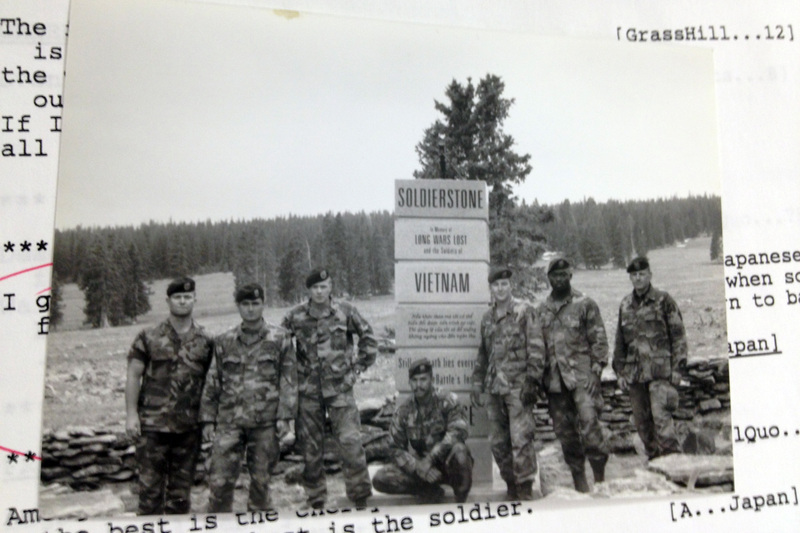 Stuart Allen Beckley secured the location for Soldierstone, coordinated volunteer groups and the stonecutter Donelson just months before he died of cancer. He sent out copious notes and letters when he was still strong enough to type on a typewriter. When he was too ill, he sent out voice memos. When asked what fueled Beckley's drive to build Soldierstone, Mike Donelson offered his opinion. "Always in the back of my mind, this project was something he needed to finish to kind of release, calm himself, maybe forgive himself," said Donelson. "That's the idea [I came to] over many years of conversation, and we became good friends." "Many of them died because of my 'push' and drive. Yes, I believed in what we were trying to do; and fought as much for them as for us, carrying a false hope that they would ultimately benefit. But they paid the ultimate price. But I think they knew that I cared; and now, very largely because of your help, my promise to them has been kept and I can go to a 'Soldier's Peace.'" With that letter, Beckley closed the chapter on his final mission. 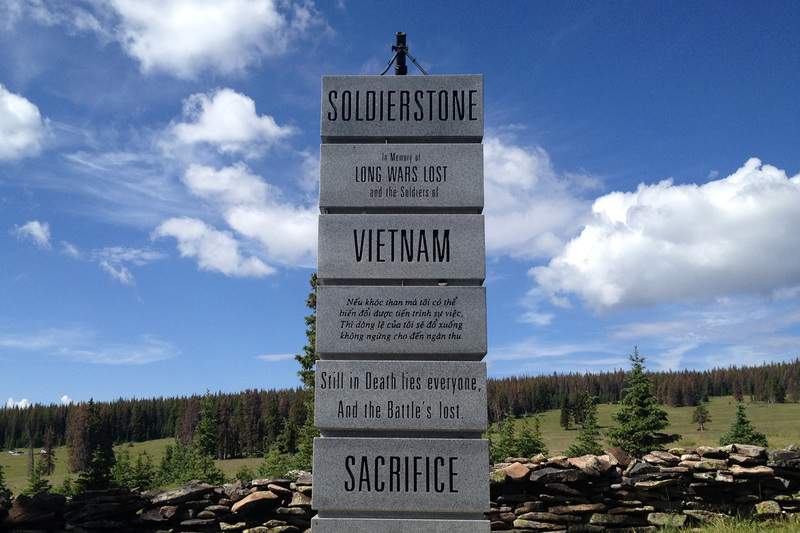 Soldierstone was completed in July 1995, he was too ill to travel to southern Colorado to visit it. Lieutenant Colonel Stuart Beckley died November 5, 1995. As more discover the site, there's a question about whether that changes the central meaning of a memorial meant to be infrequently visited.